Lay QR Codes or Food Group Info Sheets (if not 1:1) at your stations. Food information was created from the following websites: Eat Right, Kids Eat Right ,Choose MyPlate and from this chart. Students are divided and sent to stations to begin filling in their notes/graphic organizers, moving to other stations until are are completed. If time permits, I show this video to recap and pull the entire concept together. Students apply their notes along with the MyPlate website, if needed, to complete the MyPlate Follow-Up assignment and then review with the MyPlate Food Sort found as a freebie on TPT. I collect the Follow-up assignment but you could go over it as a class. As part of an assessment, students show me they can plan a meal according to MyPlate. The MyPlate Virtual Assignment uses a Google Slides template, shared by FACS teacher Nikki Heflin of Indiana. 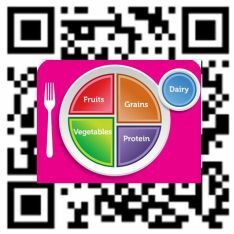 You could also assign students the MyPlates Food Guide Assignment found in this POST which includes an updated version of the activity, shared by FACS teacher Patches Moat of Idaho. Hawaiian Pizza-Dillas–My students voted this a class favorite! What grade level did you use this with? Love this!! Thank you! I’ve used it with both junior and senior high with success, but continuously use it with junior high! Thank you, Kim–this looks great!